Mr. Tilak Marapana, Minister of Foreign Affairs, Sri Lanka, and Ms. Sushma Swaraj, Minister of External Affairs, India, discussed India-Sri Lanka bilateral relations during Mr. Marapana’s three-day visit to India. He also paid a courtesy call to India Prime Minister Narendra Modi. India Prime Minister Narendra Modi said that BRICS nations (Brazil, Russia, India, China, and South Africa) share the responsibility to shape an agenda to help developing nations. He also spoke of the need to deepen ties with Bay of Bengal Initiative for Multi-Sectoral Technical and Economic Cooperation (BIMSTEC) countries. Prime Minister of Nepal, Mr. KP Sharma Oli emphasized the importance of enhancing regional cooperation in South Asia, at the June 2016 SAARC Cabinet Secretaries Meeting held in Kathmandu, Nepal, where member states gathered to discuss good governance and how to resolve governance issues in the region. Mr. Shaktikanta Das, Secretary, Department of Economic Affairs, India called on member countries of the SASEC Program to develop synergies through cooperation, in his inaugural address at the Second Regional Consultation Workshop on SASEC 2025. He also highlighted SASEC's strength as a project-driven initiative. Taskforces in energy cooperation, trade facilitation, trade infrastructure, foreign direct investment, and people-to-people contact will be formed to promote connectivity and trade in the South Asia Association for Regional Cooperation (SAARC) region. The taskforces will examine key areas for regional cooperation in greater depth. Prime Minister Narendra Modi outlined a 10-point program for future cooperation, ‘Das Kadam’, proposed during his address at the BRICS – Brazil, Russia, India, China and South Africa – plenary at the 7th summit in Ufa, Russia. The program included a trade fair, railway research center, and digital initiative, among others. The Economic Cooperation Strategy was also adopted by the world’s five growing economies at the Summit. The 48th Annual Meeting of the Board of Governors of the Asian Development Bank (ADB) will discuss regional developments in Asia and the Pacific on 2-5 May 2015 in Baku, Azerbaijan. Scheduled events will explore the general theme “Fostering Partnership for Development,” including the need to enhance regional cooperation and integration within Central Asia and the South Caucasus. Nepal Prime Minister Sushil Koirala emphasized Nepal's strong engagement in the process of regional cooperation—through membership in the South Asian Association for Regional Cooperation (SAARC) and Bay of Bengal Initiative for Multi-Sectoral Technical and Economic Cooperation (BIMSTEC)—as “a major defining feature” of Nepal's foreign policy in a speech delivered at the 67th anniversary of Nepal Council of World Affairs on 18 February 2015. During Plenary Session 5 of the annual Confederation of Indian Industry Partnership Summit, Asian Development Bank (ADB) Vice President Wencai Zhang spoke on growth and cooperation in South Asia. He emphasized the benefits of regional cooperation and cross-border connectivity such as reduction in trade costs, efficiency, and participation in regional and global value chains. The Ministry of Foreign Affairs in Nepal formed an advisory committee on 27 March 2014 to give suggestions in preparation for the South Asian Association for Regional Cooperation (SAARC) Summit and play a proactive role in the SAARC process, particularly in implementing decisions related to regional integration. On 9 December 2014, the committee evaluated and received feedback on the SAARC Summit, concluding unanimously that the 18th SAARC Summit was a success. The South Asian Association for Regional Cooperation (SAARC) marked its 30th Charter Day at the SAARC Secretariat in Kathmandu, Nepal on 8 December 2014. SAARC Secretary General Arjun Bahadur Thapa hosted a reception attended by Nepali Vice President Paramananda Jha as chief guest along with dignitaries, high-ranking government officials, and representatives of civil society, business community, and media. A draft Regional Cooperation Framework for Facilitation of International Railway Transport was discussed at a regional meeting organized by the Transport Division of the United Nations Economic and Social Commission for Asia and the Pacific (UNESCAP) on 13-15 October 2014 in Bangkok, Thailand. The South Asia Department of Asian Development Bank (ADB) will host a validation forum on the Gender Dimensions of Regional Cooperation and Integration in South Asia, on 28-29 October 2014 at ADB Headquarters in Manila, Philippines. Results of two complementary studies (i) “Gender, Trade and Green Growth in Bangladesh, Bhutan, India, and Nepal” and (ii) “Gender and Safe Mobility: Promising Global and Regional Practices” will be presented. The Royal Kingdom of Bhutan hosted the Eighth Meeting of the South Asia Free Trade Area (SAFTA) Ministerial Council in Thimphu, Bhutan on 24 July 2014. Increasing regional economic cooperation to boost intra-regional trade among member countries of South Asian Association for Regional Cooperation was the primary agenda. 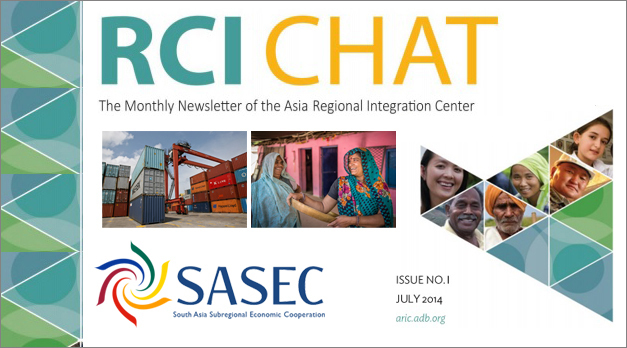 RCI Chat, the monthly newsletter of the Asia Regional Integration Center (ARIC), features the South Asia Subregional Economic Cooperation Program in its maiden issue. Subscribe to receive the monthly issue. Over 100 participants gathered to discuss green freight and logistics at a regional training workshop organized by the Asian Development Bank (ADB) and Gesellschaft für Internationale Zusammenarbeit (GIZ). The workshop took stock of best practices and systematic approaches toward efficient logistics and green freight, and provided a platform to explore multiple initiatives currently being developed in Asia. SASEC countries Bangladesh, Bhutan, India, and Nepal have endorsed the SASEC Trade Facilitation Strategic Framework 2014–2018 (TF Strategy) for implementation. The TF Strategy supports the mission of the SASEC Transport and Trade Facilitation Strategy “to promote the prosperity of the subregion by facilitating the efficient movement of trade across the borders”.